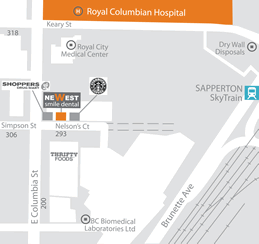 Newest Smile Dental provides quality family and cosmetic dentistry in a friendly, modern office in the Brewery District, which is conveniently located next to Sapperton Skytrain station in New Westminster. Our office offers the latest technology, highly skilled staff, and a caring, relaxing environment, to ensure our patients are always comfortable. As you enter our office, you will notice the energy and vibrancy of a young facility that is family oriented, while also providing cosmetic and sedation dentistry, for our patients requiring such services. Recognizing that good oral hygiene begins at an early age, we are happy to accept patients as early as 6 months after their first tooth erupts, or by 1 year of age. We are committed to preserving our environment. Therefore, Newest Smile Dental uses paperless patient files and digital x-rays, which minimizes paper waste, eliminates harsh chemicals and significantly decreases radiation exposure.